Looking for top-notch places to trick or treat? One of the best parts of Halloween in San Francisco is finding the neighborhoods where kids (and let’s be honest, parents) can score the best candy in town. From haunted spots to corn mazes; there’s something for everyone this Halloween. Your biggest challenge will be finding a pillowcase big enough for all your loot! Every year the residents of NoPa throw a Halloween block party. The festival takes place at the 1500 and 1600 block of Grove Street and includes a kids-only costume contest, a haunted house and trick-or-treating. Guests are asked to bring a bag of candy to donate to the event to ensure that all kids in attendance get plenty of sweet goodies. The North of the Panhandle Neighborhood Association does its best to keep the party contained with a PG atmosphere, so it’s safe for everyone. n-the-know locals head to Fair Oaks Street between Noe Valley and the Mission, specifically 21st and 26th Streets. Roads are closed off to traffic, so you don’t have to worry about cars. Most houses start handing out candy around 6pm, so if you’ve got young kids, get dinner in the neighborhood. Barney’s Gourmet Hamburgers and Patxi’s Pizza are the most child-friendly stand-bys. One of the ritziest neighborhoods in San Francisco, every year Sea Cliff attracts a couple hundred trick-or-treaters looking for the biggest and best treats around. Rumor has it that the denizens of this neighborhood (once home to the late Robin Williams) hand out full-sized candy bars instead of the mini bars that are standard Halloween fare. While kids freak over giant treats, parents will enjoy getting a glimpse inside the breath-taking mansions. Most of Sea Cliff is flat and the sidewalks are wide, so it makes for an easy walk, and it’s not too hard to find parking. Head to Belvedere Street between 17th Street and Parnassus Avenue for one of the city’s most well-known Halloween celebrations. The houses are wildly decorated with ghouls and goblins, dropping spiders, flashing strobe lights and glowing jack-o-lanterns. The street is closed to thru-traffic and is an incredibly popular spot to trick-or-treat, so go early to ensure that you hit up the houses before they run out of candy—it can get very crowded. Also, be prepared to search for parking and note that Belvedere is on a hill, so if you have toddlers who might get tired, consider adding some sort of wagon element to their costume. With dark and quiet streets, Glen Park is a snoozy but spooktacular little neighborhood on the outskirts of SF that’s easily accessible by BART. The small main street (which is only a few blocks long and dotted with shops and restaurants) is directly across from the Glen Park Bart Station. Simply grab the costumed kiddos and head to the surrounding residential area; most neighbors place carved pumpkins on their front porches to greet trick-or-treaters and many of the storefronts hand out candy as well. A Halloween block party happens each year in West Portal on Wawona Street between 14th and Taraval Streets. This area has been a well-known spot for trick-or-treating for quite some time: native San Franciscans have been asking for candy here since the early ‘80s, and for about a decade back in the ots, the neighborhood threw a huge, annual Harry Potter-themed party every Halloween. This year, West Portal dwellers can expect at least one haunted house—complete with live actors and scary surprises—that will be free and open to the public. 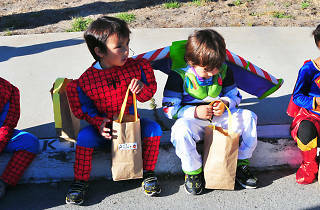 Lake Street has two regions that are good for trick-or-treating: along 5th and 9th Avenues and 23rd to 25th Avenues. If your kids have lots of energy, simply walk from 6th to 25th along Lake Street and stop at the most friendly houses along the way. The street fills up with kids and parents all admiring the elaborate decorations and munching on mountains of candy. It’s a fun, peaceful and super family-friendly celebration. 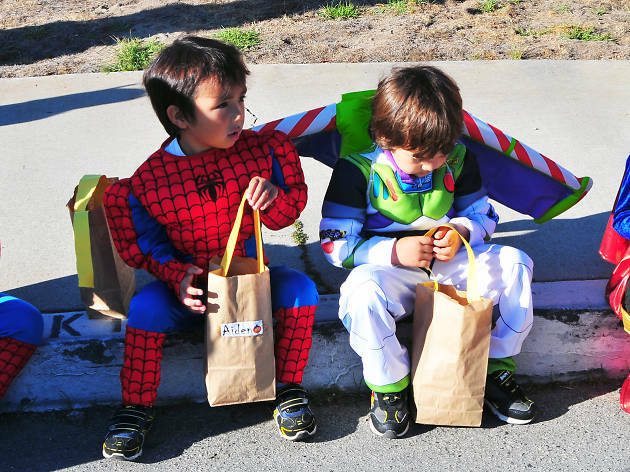 This ‘hood is home to many families, and each year the Sunnyside Neighborhood Association hosts an annual Halloween block party and carnival with food, games, face painting, a haunted house and costume contests for both kids and adults. (Check out the Neighborhood Association's Facebook page in the weeks before Halloween for specific location info.) Bring the kids for the festivities, which take place during the afternoon, then head to nearby Monterey Street for a block or two of trick-or-treating; the homeowners there are used to opening their front doors and handing out candy.